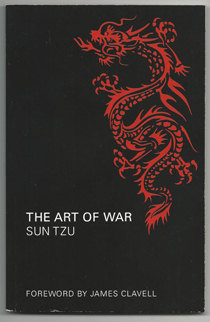 This post, the first in the series, is about The Art of War by Sun Tzu. This 2,500-year-old text, less than 11,000 words in total, is broken into thirteen themed sections, each of which contains a list of numbered principles only a sentence or two long. The message, in essence, is "Fight intelligently so you'll always win." See below to find out what you need to know to decide whether you should read it, or what you should know about it even if you never do! Is The Art of War relevant in the Western world today? Maybe yes and maybe no. Part of the appeal of Sun Tzu's work in the West is its ancient, foreign mystique, but its very foreignness makes it impossible to understand. Studies have shown that people in Eastern and Western cultures think differently. Surely, therefore, Western thinkers will fail to properly understand Sun Tzu's advice. For example, what is meant by harmonise in the following passage? Surely "harmony" is a collective concept that would have had more weight in ancient China than it has today in the West. If the underlying cultural context of The Art of War is fundamentally Eastern, its advice can hardly be said to apply in the West as well as in the East. As Kipling says, never the twain shall meet. Sun Tzu's advice is abstract and therefore eternal. Kipling's poem, however, goes on to say that "there is neither East nor West... when two strong men stand face to face." Perhaps a modern reader can stand face to face with Sun Tzu and understand him perfectly. Consider this passage. In other words, when one's mental and physical resources have been consumed, one is vulnerable to misfortune. That's no less true now than in ancient China, even if we aren't wielding bladed weapons against an enemy state. Even if Sun Tzu's advice was meant for generals and kings, much of it amounts to basic psychology: he warns us against foolish extremes of behaviour, admonishes us to prepare for important events, and reminds us to remain calm under pressure. Sun Tzu's advice is too vague to be useful. Couldn't anybody advise us to avoid foolish extremes, prepare for important events, and remain calm under pressure? I'm reminded of another thin, bestselling advice book, one called The Richest Man in Babylon, by George S. Clason. Critics whine that the only thing the book says is "Spend less than you earn and you'll never go broke," which is true by definition. The basic idea is obvious and worthless; execution is everything. The same could be said for The Art of War. The quality of decision is like the well-timed swoop of a falcon which enables it to strike and destroy its victim. Therefore the good fighter will be terrible in his onset, and prompt in his decision. One could scarcely advocate the opposite, but Sun Tzu leaves us on our own to figure out just how to achieve this kind of timing and result. Moreover, some of Sun Tzu's suggestions seem to contradict one another. Generals should care about their soldiers' well-being, but not too much. Brevity makes this balancing act sound easy, but the lack of useful detail at times gives the impression of a certain frustrating circularity. We have different war technology. The details of war have changed drastically over the centuries. In particular, we have communications technologies Sun Tzu could never have dreamt of. The ability to command large numbers of soldiers may still be considered an art, but perhaps now the difficulty is deciding how much independent decision-making power to allow them in carrying out their orders, especially considering the power of the weapons now at our disposal. Most of us aren't at war! I say "our disposal", but most of us aren't even in possession of guns, to say nothing of nuclear missiles. There are many adaptations of The Art of War for applications that are not military in the slightest. There are versions for managers, writers, and even six-year-olds. Although approaching life's challenges strategically is an honourable goal, approaching non-military aspects of life with a zero-sum, life-or-death kind of attitude is not appropriate. War is terrible! It requires constant vigilance, cold-blooded sacrifice, and a skill for deception paired with a reluctance to trust. Who wants to live like that? To be fair, the copycat books presumably offer a whimsical spin on Sun Tzu's necessarily grim advice. Still, I question the idea that a military strategy book is relevant to life in general. Relevant or not, people insist on consulting The Art of War. Though there are some sceptics, many happily consult The Art of War in a wide variety of circumstances. If you doubt the extent to which Sun Tzu's advice has become embedded in modern culture, have a look at all the conversations about The Art of War on Quora! Today the text may not be interpreted in the way Sun Tzu meant it to be, but the fact that anyone still bothers to make use of it at all speaks to its power, even if that power stems from reasons not directly related to its applicability. The edition I read is based on the 1910 translation by Lionel Giles, and contains his notes inserted directly in the text. Certainly there are other, more recent translations as well, but the Giles translation is no longer under copyright and thus can be read online or downloaded for free.